I never cared to try or review this 'OneAD' app. I always thought why would anyone need an app that is supposed to display offers and deals on your lock screen but won't pay you for that. And the only way to make money is to refer your friends. How far can you go with that? I had made all that up just by reading a few lines of description. But, don't know why I decided to try OneAD. And I'm proud to say "I was absolutely right". 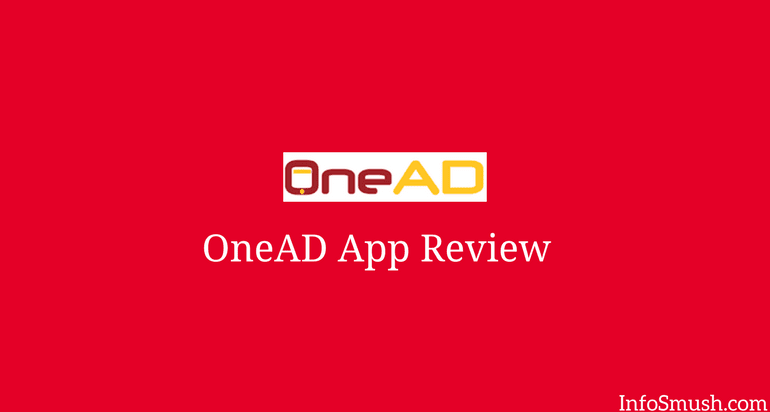 OneAD is the most absurd app I've ever reviewed. And when you read the whole review you'll know why. OneAD is a useless app and in this review. Like I earlier said OneAD displays coupons and offers on your lock screen. And that's what they in the description on the play store. but, what they don't tell you is that they display Ads before offers on your lock screen. And if you want to turn off the ads your income from active referrals(more about active referrals later) will reduce by 75%. Seriously, why would you want to see offers on your lock screen when apps like Slidejoy pays you for the same. You can earn money by referring your friends to OneAD. But the problem is they gotta be active for you to earn even a penny. So, who is an active referral? Well, an active referral is one who allows OneAD to run ads on the lock screen & OneAD is able to display ads on a daily basis. Basically, they are drawing huge income by throwing ads on your lock screen(and also when you use the app) and sharing a small part with you. Trust me, if your referrals want to get offers on their lock screen they would simply turn off ads. But then, they won't be active. This contest was recently introduced. In this contest, you can win up to Rs. 50. The contests start at 12PM and held for every 3 hours (12-3,3-6,6-9). You don't have to pay anything to participate. 1. On the wheel, there are prizes ranging from Rs. 1-50. And each prize has a different number of winners. E.g., Rs. 50 prize has only one winner while Rs.1 prize is given to 50 users. You spin the wheel and on whatever prize the arrow is pointing(when the wheel stops), you can play for that prize. You can spin the wheel again by watching a video. 2. After you have the prize you want, you need to tap the Confirm & Play button. 3. Now you will be asked a question. You answer correctly, your entry is confirmed. 4. The winners are chosen randomly. You can withdraw your winnings to your bank account. Contests are the only sane way to earn a little cash on OneAD. You won't be able to make anything out of their referral program. As to earn from your referrals, your referrals should be active. Meaning they need to allow OneAD to run ads on their lock screen. Why would they do that, when they have nothing to gain by those ads. If they wanna see offers and deals they can turn off Ads. But then, you won't get anything. So, OneAd is "the worst legit app". download the Onead App and register with my onead referral code "144XEA" and get Rs 4 signup bonus.